The perfect footwear for any upcoming zombie apocalypse. 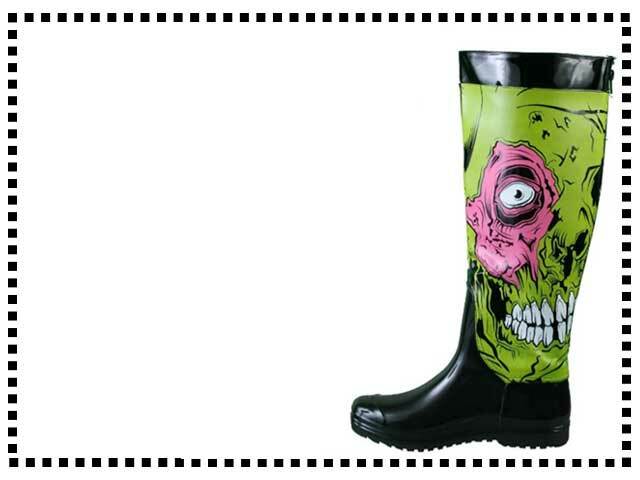 Created with the classic Iron Fist zombie graphic you will definitely stand out in the crowd with a pair of these beauties. These boots are not your bog basic wellies by any means, they come with rear zip-ups, pretty black bows and cute pink lining. Very cool boots. Heads turn when you wear these wellingtons. I love everything Iron Fist. I love these. I bought them for the fall and wore them out for Halloween, I had so many compliments. Great quality, I love the pink lining. Not sure how waterproof these wellies would be because of the zip. They are really cute though, fab design. I collect anything Iron Fist and just had to have these rainboots as soon as i saw them, they are super cool. Groovy wellingtons, I have had a shed load of compliments about them. I can’t wait for the rain so I can pull these bad boys on.